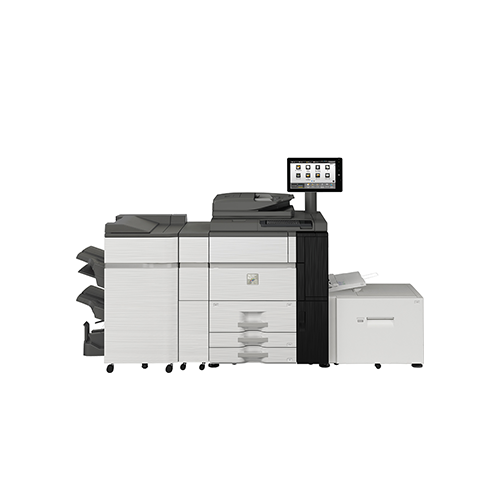 Sharp MX-7090N | The Miller Company, Inc.
Results-driven, the versatile new Sharp Pro Series color document systems deliver ground-breaking performance. The new Pro Series MX-7090N and MX-8090N light production color document systems offer proven technology, award-winning features and exceptional image quality at speeds up to 80 ppm. Built with the customer in mind, producing professional-looking documents has never been easier. Organizations, large and small, will benefit from the versatility of the available input and output options. Options ranging from the air-feed paper handling option, to the production booklet finisher that prints up to 120 page full-bleed booklets, the Pro Series can help your organization produce more jobs in-house, saving time and money.